Nations Press health POTATO POWER: 8 HEALTHY REASONS TO EAT MORE POTATOES! START IT NOW! POTATO POWER: 8 HEALTHY REASONS TO EAT MORE POTATOES! START IT NOW! 1. Beta-Carotene: Sweet potatoes are actually quite known for being able to provide more than 400% of a person’s daily requirements for vitamin A. Beta-Carotene is a form of Vitamin A that is responsible for taking care of your skin and eyes. It also keeps the immune system strong, while protecting the body against foreign elements. 2. Fiber: According to the Harvard School of Public Health, many diets do not meet the required amount of fiber each day, which is from 20 to 35 grams. However, consuming one cup of sweet potatoes can give 6.6 grams of fiber. 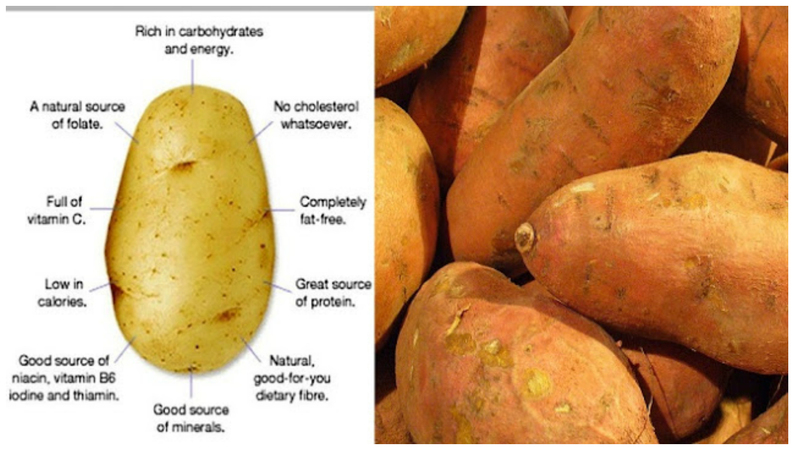 Eat more sweet potatoes to have more fiber in the body for digesting food. When you have enough fiber, you lower the chances of developing hemorrhoids and getting constipated. 3. Vitamin B6: B6 is the natural enemy of homocysteine, which is a chemical found in the body that is linked with diseases, such as heart attacks. 4. Vitamin C: Sweet potatoes are also rich in vitamin C, which is the vitamin known for being able to ward off flu and cold viruses. This particular vitamin also helps in the formation of bones and teeth. It also aids in blood cell development and digestion. 5. Vitamin D: This vitamin is crucial for the immune system as well as your overall health. Primarily, it is produced when you get enough sunlight. When you have high levels of the vitamin in the body, you have enough energy, which will help you last through the day. Plus, it aids in building healthy bones. Consume more sweet potatoes to receive these benefits along with a healthy heart, skin, teeth, and nerves. 6. Iron: Sweet potatoes are a good source of iron, which is a mineral that provides you with adequate energy. Iron also plays an important role in the body, including with the production of red and white blood cells. If you have enough iron in the body, you can resist stress and your immune system will function properly. 7. Magnesium: Magnesium is a mineral that can help you de-stress and relax. It is necessary, so you can have healthy arteries, bones, heart, muscle, nerves, and blood. Magnesium also helps in assisting your endocrine system, so that it does its job without problems. 8. Potassium: Potassium is a type of electrolyte that aids in regulating your heartbeat as well as your nerve signals. Other essential functions that potassium performs include reducing inflammations, protecting the kidneys, and relaxing contractions of the muscles. Add sweet potatoes into your diet, so you can get the health benefits they offer. You can achieve good health and even prevent specific diseases with the help of sweet potatoes.